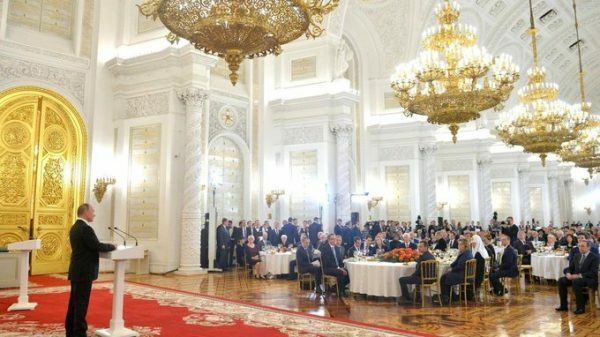 On November 4, 2016, His Holiness Patriarch Kirill of Moscow and All Russia attended the state reception in the Kremlin on the occasion of the Day of Unity of the People. During the grand reception, President Vladimir Putin presented the Orders of Friendship and Pushkin Medals to foreign citizens in recognition of their contribution to the strengthening of peace, friendship, cooperation and mutual understanding among nations. The Presidential Award for Contribution to Strengthening Russia’s National Unity was presented for the first time since its establishment in 2016. The award is presented for fruitful activities aimed at strengthening the civil consciousness and spiritual unity of the multiethnic people of Russia, harmonizing interethnic relations and developing the ethnic and cultural diversity of the peoples of Russia. The honorary chairman of the State Council of the Republic of Dagestan Magomedali Magomedov became the first winner of the award, the Patriarchal Press Service reports with reference to Kremlin.ru. ‘I would like to extend my warmest wishes to you on Unity Day. ‘This holiday was established as a symbol of the unbreakable bond of our people with the fate of the Fatherland, its history full of great achievements, severe tests and heroic victories. ‘Sincere love of the Motherland, readiness to protect it at all times has served as a reliable basis of the independence and sovereignty of our country. ‘More than four centuries ago, people of different nationalities and classes were united by deep, true feelings of patriotism. That was when the people, amidst all the discord, took responsibility to prevent the enslavement of the country. And this powerful unity made it possible to put an end to the tragedy of the so-called Time of Troubles, expel enemies from the homeland, stand up for the right to live according to one’s own principles and traditions, and preserve the unique Russian state, which was already a centre of world civilisation then. ‘And today, as we look back on those events centuries later, we feel the greatness of the civic deed of our ancestors, which was repeated many times by their descendants who defended the country, its honour and dignity. ‘Our strength lies in our loyalty to the traditions of national unity, our loyalty to the higher freedom an individual gains from taking the oath to the Fatherland, and our unwavering love of country, which cannot be felt on command. It is in our hearts’. Among the participants in the event were representatives of the Russian Orthodox Church including Metropolitan Juvenaly of Krutitsy and Kolomna; Metropolitan Varsonofy of St. Petersburg and Ladoga, chancellor of the Moscow Patriarchate; Metropolitan Hilarion of Volokolamsk, head of the Department for External Church Relations; Bishop Pankraty of Troitsk, chairman of the Synodal Commission for Canonization; Bishop Sergiy of Solnechnogorsk, head of the Moscow Patriarchate administrative secretariat; Bishop Tikhon of Yegoryevsk, chairman of the Patriarch Council for Culture; Mr. V. Legoida, head of the Synodal Department for the Church’s Relations with Society and Mass Media, and Archpriest Vladimir Vorobyev, rector of the St. Tikhon Orthodox University of the Humanities.